The Nexus 4 is probably the most sought after device on the planet right now, with supply so tight it just cannot meet the demand. The device is obviously so precious for Google, it internally calls it... an iPhone. This is what happens when Google is the only one to develop the platform and there is no one to check about mistakes in the code. The issue was originally noticed on a Samsung Galaxy Nexus, but it can also be reproduced on a Nexus 4. A change in the Android Open Source Project has already fixed the issue, but its existence is what’s fun in the first place. You can try and reproduce it by going into /system/app/SetupWizard.apk on your Nexus. iOS code is not open source so how he would copy it? Think twice before saying something! Yea, that's right, think and post wisely! but they do can get code even though its not an open source....the ipsw file decoding or using some insider or something......hope apple wont start suing them again for this ! Maybe it's time for Google now. 1st it was Nokia, then Apple and now Google. Though i think it's nothing major! Correct... it'll be just like a goodwill deed. LOL Google!Why was the word iPhone even there in the first place? This is not wishful thinking. An example of wishful thinking relating to these two phones is if Apple internally referred to the iPhone as a Nexus 4. 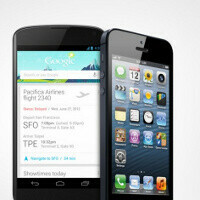 Calling a Nexus 4 an iPhone is a disgrace. All those responsible should be fired immediately. if i am a kid here's what i think- THAT NEXUS' EVIL!! KILL IT BEFORE IT MAKES FRIEND WITH THE IPHONE 5! If I'm a sensible Guy here's what I think- Just some minor Software update will solve it. This is so made up. My friend has Samsung nexus & sister has Nexus 4. In the wifi menu, this msg doesnt appear (on both devices) when turning on data connection. The snap put here is definitely from a rooted device & an xda developer's custom ROM. in swedish? maybe you're using it in english? you didn't mention that. TIL: Hoppa Over = Next in Swedish. Bhahahhaha! Giggle copycats!!! Hahahah! In every aspect! So pathetic! In Android you can do that and many more thats why I love it.